Deciding to take an early dinner ( to outwit an impending snowstorm ) , Laura and I drove to Swansea, Ma. 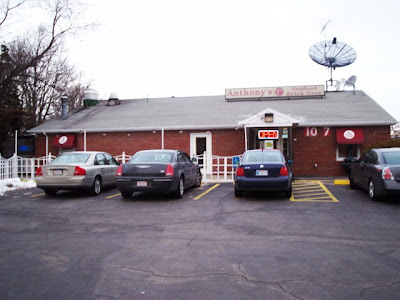 to Anthony's 1st. ( I don't know why it's the first and I don't know where the heck the 2nd. 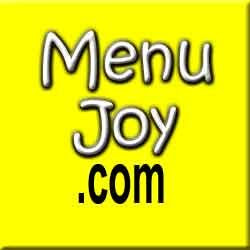 is ) , a restaurant we've visited a few times before . The parking lot had quite a few cars but when we entered the restaurant ....we were the only ones in the dining room ! Seems the rest of the crowd were in the bar ......" fortifying " themselves for the storm . Well, Laura & I tend to " fortify " with food ! BIG SURPRISE ! We were seated at the same table I think we always have when we come here and started to look at the menu . 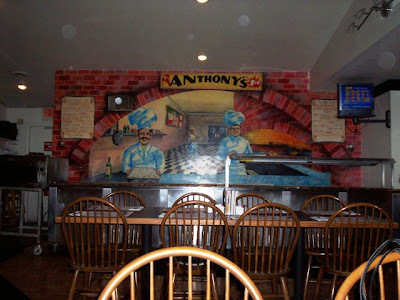 Anthony's has an extensive menu .....pizzas, seafood , steaks and chops , appetizers and a small but tasty salad bar . They have two very popular specials that run certain days of the week .........a ROAST BEEF buffet ......and a CLAMBOIL buffet . This area LOVES a good clamboil . 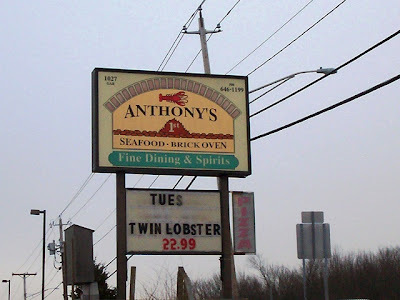 They also have a twin lobster special that is quite popular . So you can see ....you have a lot of choices . 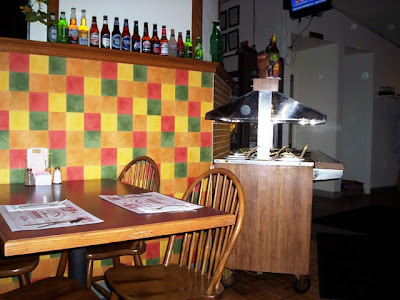 On this frantic " snowstorm's coming " day ...we decided to share a buffalo chicken appetizer, a large linguica pizza and a couple of diet cokes . For those of you who aren't from the area ......linguica is a milder , chourico-like spicy sausage . It's yummy . A friendly waitress took our order and returned quickly with our drinks . They were HUGE ! No need for refills here . It also didn't take long for her to bring out our appetizer . 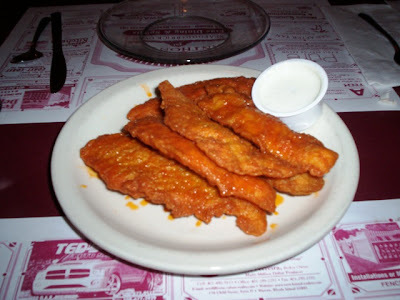 These buffalo chicken tenders were SO nicely done . Very mildly spiced , cooked perfectly and each one a generous size . I've found tenders to be shrinking in size at some restaurants lately . Instead of a tender ....you get a tend ......Anyway , they were really good . We had barely finished our chicken when out came our pizza . It looked and smelled great ! Best of all .....it tasted great ! The crust was sooooo good ......light and not too thick or thin and really tasty . The sauce was mildly spiced and the linguica was cut into little disks and generously spread over the top . It was delicious . We'd made a good choice . In fact , everything we've ever gotten here has been terrific . We've had pasta , seafood , pizza .....and NO complaints about anything . Plus ...the service has always been spot-on . And as you will see ....prices are great too : 2-cokes , buffalo tenders , lg. 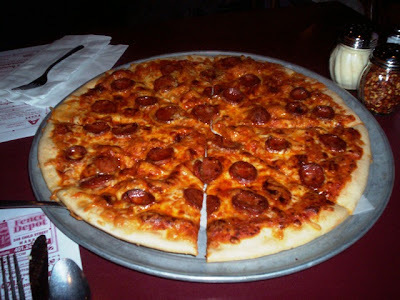 linguica pizza ............. $ 25.14. Not bad , huh ? With a tip ....we left $ 30.00 on the table . Laura & I both used the ladies before we trudged out into the impending storm , and we found it very clean & neat . Anthony's 1st. .........we'll be back .